To be frank, this is a rather uneven double bill. It opens with the solo, Tilted Fawn, by Melanie Lane, a strange construction, part evolving sound installation, part dance performance. Lane is a strong dancer, the inhuman shapes she creates in the intense but brief dance break are fascinating. But it's hard to understand her devotion to the small, noise-emitting cardboard boxes which take up the rest of the 40 minutes of her piece. The sound which comes out of them is not pleasant, nor even particularly interesting, mostly looped samples of voices and possibly found sounds, however the bass-heavy, sustained music which pulsates from the larger, hidden speakers creates a much more inviting soundscape, rumbling and thudding, enveloping the small space. Lane's actions are, on the whole, predictable and monotonous. Stacking and shifting, re-arranging, pushing, occasionally aligning her body with the structures she creates. It's simple and clear, but there just doesn't seem to be enough depth beyond the immediately apparent action to engage the imagination or even incite sympathy. I suspect it was Antony Hamilton's Black Project 1 which most of the capacity crowd came to see on opening night. Many in the audience were local dancers, choreographers and administrators who would be familiar with Hamilton's work, and they weren't disappointed with this effort. On many levels, it had strong similarities to his 2011 production Drift, though it was also very different. Both have a post-apocalyptic feel, with strong tribal elements, brilliant sound, lighting and projections. 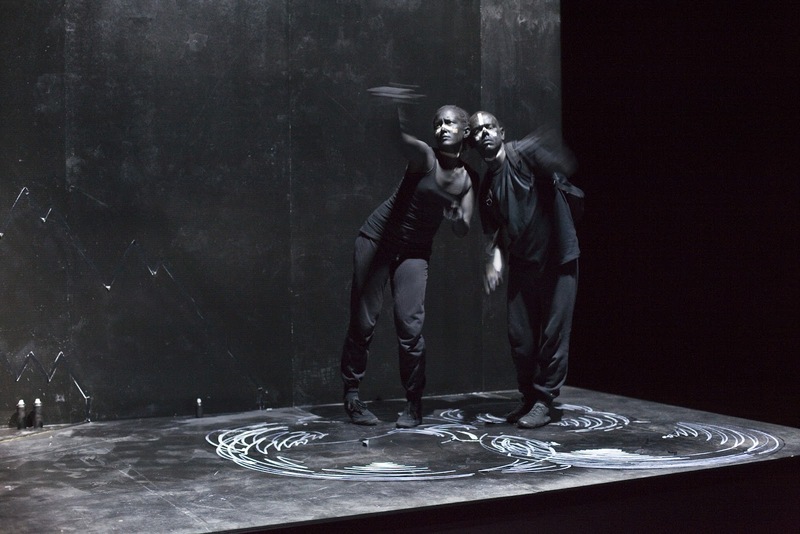 Yet where the small ensemble of Drift seem to traverse a narrative arc, the two performers in this piece (Lane and Hamilton) enact a highly ritualised series of actions within a very limited space, quite abstract, and perhaps not particularly interesting on their own, yet producing some spectacular effects. Continuing Hamilton's interest in combining graffiti with performance, the darkly costumed and body painted pair create or reveal a series of markings, from concentric circles to zig zags, cloudlike puffs to jagged line designs. Modern day cave painting perhaps? The movement is also very similar vein to that of Drift. Lane was one of the performers in that piece, which partly explains her familiarity with Hamilton's popping movement. It's a close relative of hip hop, but stripped of it's original flavour and morphed into a contemporary idiom. Fast, detailed, jagged, tiny, almost perfectly synchronised. By the end of the piece it becomes clear that the movement is really just one element of this event. Amazingly accurate projections by Olaf Meyer light segments of the stage with split second timing, while the music rumbles. It's the same precision and speed which marks the choreography, an almost mechanical, futuristic, shockingly beautiful play of light. Hamilton has limited himself here, in colour palette, movement vocabulary, even the gradual progression of action across the stage, and in the process created an eye-catching performance.